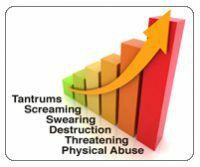 Defiant Child Behavior: Is Your Child’s Bad Behavior Escalating? Before you had kids, you probably expected your child to misbehave at times. Acting out behavior is nothing new, after all––you probably didn’t follow all of your parent’s rules growing up, yourself. You saw friends – and even strangers – parenting kids who had tantrums in stores or restaurants and it all seemed pretty typical. Children test limits and parents respond with consequences. That’s the way life goes. It comes with the territory of having kids. What you probably didn’t expect, though, was that someday — despite your best parenting efforts — your child would not only refuse to respond to your discipline, but the behavior would actually worsen over time. When a child starts exhibiting behavior problems, parents will try anything they can think of to get a handle on the situation: consequences for negative behavior; rewards for positive behavior; behavior charts; talking about the behavior; talking about how to change the behavior; ignoring the behavior in the hope it will stop if you don’t give it attention; talking about positive ways your child can get your attention. If we can name it, you’ve probably tried it. When a child’s behavior continues to escalate in the face of every discipline technique you can think of, it’s terrifying. Kim Abraham has raised an Oppositional–Defiant child and knows the utter sadness, hurt and frustration that comes from parenting a child who fights against rules and limits. You start to question yourself, your ability to parent effectively, and what’s worse, oftentimes others (teachers, family members, neighbors) start to point the finger of blame at you, too! Fear that you’re failing as a parent can turn to guilt, shame and desperation. If your child’s behavior continues to escalate despite all your best efforts, you may want to see a professional to rule out other factors. Some children have undetected medical issues such as allergies (food or otherwise) that can truly impact their behavior. Other children who are chronically defiant, constantly breaking rules or having trouble handling frustration may be experiencing ADHD, Asperger’s Disorder, anxiety or depression. If any of these situations are occurring, getting your child the proper help can help him manage his emotions – and behavior – more effectively. There are many reasons a child’s behavior can escalate. It may be that he is becoming increasingly frustrated and simply doesn’t know how to express it. You might also find, after thinking it over, that your own reaction to your child is contributing to the intensity of his behavior. Are you easily irritated by your child, and if so, how do you respond? Dealing with a child’s negative behavior can leave a parent feeling whipped; you may not realize the role your own behavior is playing in the interactions. Even your tone of voice or the expression on your face can affect your child. It’s easy to get drawn into control battles with a child who argues about everything. There’s often a cycle that goes something like this: Your child wants something or experiences an intense negative emotion. You tell her “no” or set a limit. She tries to get you to change your mind. You stick to your guns. She gets more upset; her emotions and behavior escalate. Your emotions escalate. She tries to get her way. You try to get her to understand your point of view and why the answer is “No.” Things continue to escalate to yelling, swearing or even getting physical. During a conflict, kids sometimes go into “fight or flight” mode: they get upset, there’s a rush of adrenaline and they don’t know how to release that energy. The longer the conflict continues, the more their adrenaline pumps them up. Ending the argument by walking away shows your child he doesn’t have to stay in fight–or–flight mode. You can offer him suggestions on how he can get rid of that energy in a more acceptable way than yelling or throwing things. This can help keep things from hitting the point where they continue to escalate. Remember: your child doesn’t have to understand why you’re setting a limit. In the old days, parents never spent a lot of time explaining to a child why they were setting a limit. They might give it a sentence or two, but then that–was–that. Discussion over. You never saw Pa Ingalls arguing with Laura over her chores. Why? Because he’d have said something to the effect of, “Because I said so, now get in the barn and clean up after the horses!” Then he’d have walked away! Over the years, parents have fallen into the trap of talking to our kids too much. We talk about everything, and we want our kids to be okay with our decisions. The fact is, sometimes they’re not going to be happy about a limit or a consequence and that’s okay. That’s part of learning and growing up and that’s life. You can validate for your child that it’s hard to accept things she doesn’t agree with, and that she may be really upset, disappointed or angry. But don’t fall into the trap of believing you need to justify yourself – or your decisions – to your child and then stand there until she’s okay with it. If you do, you may be standing there a very long time—ripe for getting further drawn into the power struggle! Everyone has their own unique temperament (or disposition) and kids are no different. Some kids tend to be cooperative while some seem to argue about everything. Some are easygoing while others have a low frustration tolerance and are quick to anger. There are kids who are quiet and shy, and those who want to be heard….every moment of every day! 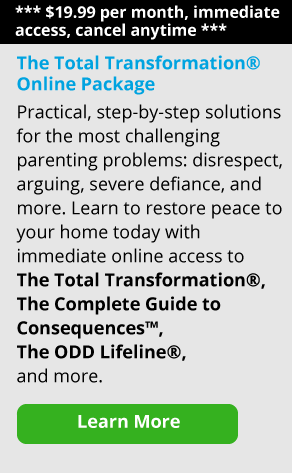 With Oppositional –Defiance, it can be hard to accept a child’s basic personality. You could spend years trying to change your child into someone else, but the bottom line is: this is your child, right now, in this moment. Accepting your child doesn’t mean you accept his behavior or agree with all of his choices. It does mean that you accept him at a basic level of being human– with his own feelings, flaws and struggles. It’s not easy to stand firm in the face of a tornado of emotion your child unleashes on you. It can seem easier to give in and sometimes it is…in the short run. But in the long run, if you can hang in there and remain consistent, your child will come to know that arguing, throwing things and getting physical won’t change your mind or your house rules. Because it can be so draining — emotionally — to follow through with consequences, you may want to target the most serious behaviors you’re seeing with your child first and then work your way down the list. Don’t give a consequence if you know you’re likely to give in. Go with a shorter consequence or response you know you’ll be able to stick to, until you’re feeling stronger. Parenting is for a lifetime. There’s no specific moment where you think, “Well, this is it. My job as a parent is done.” When you’re 50 and your child is an adult, he’ll still be your son. And you’ll still be parenting him (though hopefully in a different way). Your relationship may look different, but it’s still parent and child. Your goal is to help your child understand the world, how to live in it and what he can expect from others when he behaves in a certain way. Your home is the first place he will learn limits and rules that exist in our society. Parenting means being in it for the long–haul. Believe it or not, when you continue to consistently provide limits and consequences for your child, over the years he will learn what to expect from you — and from society. It can be very frightening and frustrating when a child’s behavior continues to escalate. Sometimes we — as parents — go into fight–or–flight mode ourselves, reacting out of emotion rather than remaining calm and providing consistent consequences and limits. Your child has the ultimate control over his behavior and choices. As a parent, you can provide discipline, love and guidance. You can support your child by offering positive alternatives to dealing with frustration and you can model those same techniques in the way you respond to your child’s behavior. Remember to take care of your own emotional wellbeing during these times, as well — get support from friends, this website, other parents or even a professional if you find your strength is suffering in the face of your child’s behavior. Parenting takes determination, pacing oneself and keeping an eye on the long–term goal. Remember, you are not alone in this marathon!